Happy World Nutella Day!!!! Today, February 5th is World Nutella Day! For the 3rd year, we’re celebrating the chocolaty hazelnut spread that is Nutella! 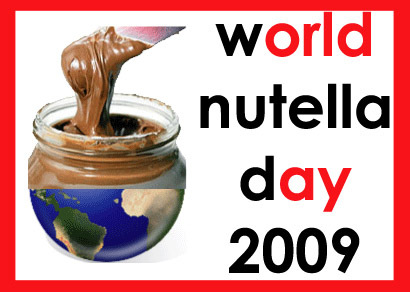 Back in early 2007 I was thinking about how there was no holiday to celebrate wonderful nutty Nutella. And World Nutella Day was born! As your World Nutella co-host, just a reminder, you must email us with your information if you’d like to be included in the World Nutella Day round-up here and at Bleeding Espresso on February 9th. If you’ve posted your tribute to Nutella today, be sure to let us know at nutelladay [at] nutelladay.com and read all the rules for participating at NutellaDay.com. But for World Nutella Day, I wanted to change it up and spice it up at the same time. Thus, substituting hazelnuts for almonds to go with beloved Nutella, and to spice it up a bit, a spicy nut center! A note about food coloring: Macarons are such interesting treats because of the colors involved! Tartelette suggests powdered food coloring, I’ve been using gel food coloring. If using powdered, you can add it to the sugar mix before adding it to the meringue. Otherwise, you shouldn’t add the gel/liquid food coloring until AFTER you’ve started to mix the dry mixture with the meringue. If you’re interested in finding natural food coloring alternatives, check India Tree’s Natural Decorating Sugars. Spicy Glazed Nuts – follow David Lebovitz’ recipe – I used pistachios, peanuts and pumpkin seeds. Remove any remaining skins and grind the hazelnuts as finely as possible. In a small container/bowl, whisk the powdered sugar together with the hazelnuts to blend well and break up lumps. If you have a large food processor, you can pulse them together a few times. Fold the dry mix carefully (and slowly) into the meringue – I use a spatula – and add the food coloring, if desired, until fully mixed. Preheat the oven to 150° C / 300F. Cook macarons 8-10 minutes, keeping a careful eye on them. After taking out of the oven, let cool completely before filling them. Put a dollop of Nutella on one half of the macaron, and 1-2 spicy nuts in the center before placing the other half on top. Store macarons in tupperware or closed container if not eaten immediately. Happy Nutella Day!!! Make sure to send us your contributions to be included in the round-up! Oh just yum. LOVE the colors too :) Happy WND!!!! Those look amazing. Happy Nutella Day. These look almost too pretty to eat. HND! Those look delicious! I am so glad I found out about world nutella day just in time! Oh my, how delicious. Perfect pop-able treats Sara! Does it get any better than this? So beautiful to look at and taste too. The homemade nutella is not my recipe. My recipe is homemade money to buy the ciocco-nocciole spread from the frantoio up there. I am loving this! Nutella macarons are decadent by themselves but theat crunchy nut center is the best surprise! Another fab event and another fab entry. Nice job on both counts Sara! Your macarons look incredible appetizing, yum yum,… Well done!! Macarons are my absolute favorite, despite the fact that I can’t find any truly great ones here in New York. So happy to have this recipe…I’m taking matters into my own hands now! I haven’t had the pleasure of tasting a macaron yet! I wish I could just reach into my screen and grab one of yours. They look divine! yummy! beautiful! i love it! Your macarons are just beautiful! What a lovely color! A fitting tribute to WND. Someday, I must bite the bullet and make some of these little gems. I thought about making macaron, but I knew that I didn’t have the time. I just found out about the event this morning when I visited David Lebouvitz’s blog. Then I had to go exercise until noon. Came home home and quickly made my dessert. Glad that I finally able to join. I really like the vibrant color of your “Macarons”, this is worth trying! Nutella day, what a wonderful day! I know it’s Nutella Day, but my attention is on the beauty of your macarons….look at the foot on those things! They are perfect (being a french-trained pastry chef, believe me, I can be extremely critical of macarons). I’m – fuschia? – with envy! I’m sooo happy we have a world Nutella day. We should have a Macaron day, as well. These ones look fantastic! Oh my, I think I’m in love. Must bookmark. Must bookmark.